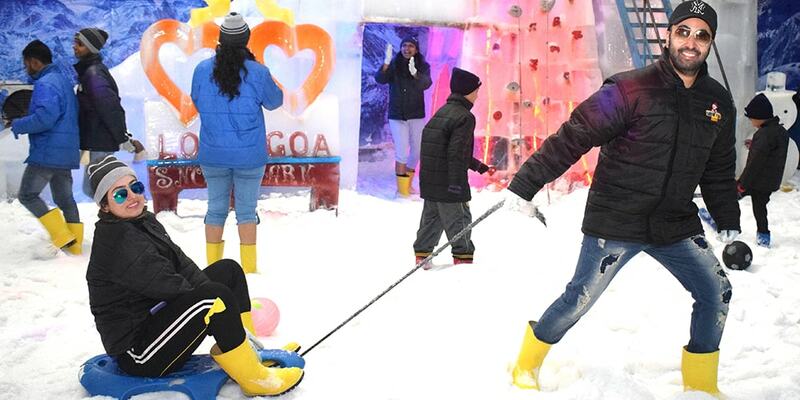 Snow Park Goa / Blog / Snow Sledging in your Favourite Vacation City !! Goa is the favourite and most popular tourist destination in India. And of course it deserves all the love as it offers the best parties in the country, it is perfect to spend some time by the sea and soak in the sun, perfect for thrilling and refreshing water activities on the numerous beaches, magical for those who like to laze on the sand make sand castles and also the home for all the snow lovers! No, there haven’t been any spelling errors! Goa indeed is one of the “Go to” destinations for Snow lovers with the Snow Park offering amazing Sports activities in Goa making it the next big thing. Out of all the amazing snow activities which the park offers, like snowboarding, snow thunderstorm, snow bar, Snow DJ etc, Snow sledging is one of the best activities. A sledge was first conceptualized ages back as an item of utility. Since in winters, the level of snow would be really high, carrying goods or traveling from one place to another on foot or even on two or four wheelers was a very difficult task. That is when the concept of sledging came into existence, wherein the main vehicle would be a flat piece of wooden or metal board which would be pulled by someone and slid downhill for better mobility. Later, animals like large ice dogs, ox, horses etc were used for pulling the sledge. With the passage of time, this activity more than a necessity became an adventure and fun sports and spread across different parts of the world. Although no matter how fun the activity sounds, it has its own share of risks involved. Each year there are a huge number of people who get injured while enjoying a snow sledging activity on the mountains. There are many amateurs who aren’t well aware of the sledge car positioning and how to handle it when going downhill or absence of a helmet, thus resulting in accidents, out of which some of these could be major ones. Today, Snow sledging is one of the most popular snow based adventure sports globally. It is loved and taken by a huge number of people across the world. The popularity of this adventure activity has brought this amazing activity indoors as well. Now with the help of awesome up beat technology, Mega Snow Parks can give you an almost “Real like Snow Sledging Experience” without any of the major risks involved like the ones in sledging on the mountains. Forget the times when you would have to travel all the way to snowy mountains, up North and European Alps to experience the thrill of Snow sledging. You can now enjoy the entire thrill at one of the most popular indoor amusement parks in Goa! So the next time, when you want to experience some snow and the chills while having fun, remember to check out the Snow Park which is one of the must-visit places in Goa.